The state’s business magazine has ranked McDuffie’s hospital as fourth in the state among small hospitals. In a December article, Georgia Trend, a statewide business publication, listed University Hospital McDuffie as fourth in the state for top hospitals with fewer than 100 beds. It listed parent hospital, University Hospital in Augusta, as 15th among Georgia hospitals with 250 or more patient beds. The rankings are based on the Centers for Medicare and Medicaid Services (CMS) data downloaded Aug. 13 and analyzed by consultants from the Hull College of Business at Augusta University. A Total Performance Score was used to rank the hospitals in each group using information on clinical process, patient experience, outcome and efficiency, wrote Mark Thompson in explaining how the rankings were determined. In addition to listing the top hospitals in Georgia in 2017, the article also focuses on why hospitals in the state are merging and how change in ownership reflects the realities of healthcare. “It is a real honor that Georgia Trend Magazine has ranked University Hospital McDuffie number four in the state for hospitals with fewer than 100 beds,” said Bob Kepshire, UHM administrator and chief nursing officer. “With 25 licensed beds, University Hospital McDuffie is one of the smallest acute care hospitals in the state. Being ranked fourth is recognition of the high quality care that is provided here each and every day by a team of compassionate and dedicated healthcare professionals. “The citizens of McDuffie County, as well as the neighboring counties, should look at this ranking as a clear sign that they have a local hospital close to home that they can not only be proud of, but also can rely on for safe and high quality healthcare. Our mission is to improve the health of those we serve, and that is exactly what we aim to do for each and every person who comes through our doors seeking healthcare," Kepshire said. The ability to provide quality and affordable hospital care and patient care is the footprint that University Hospital McDuffie seeks to deepen in the Thomson-McDuffie community and surrounding areas. 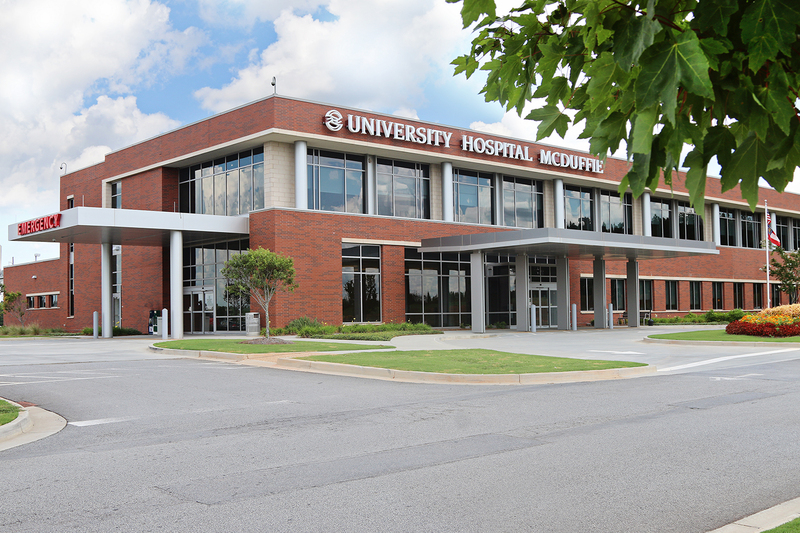 University Hospital McDuffie is a 24-hour medical facility that offers a wide array of medical and health services for the people of McDuffie County and surrounding communities. The emergency department treats more than 18,500 patients annually. The hospital has been recognized by Health Grades, a national organization that ranks the care provided by hospitals and physicians, with five stars for gallbladder surgery and hip fracture treatment. The new state-of-the-art facility at 2460 Washington Road in Thomson accepted its first patient Jan. 8, 2015. The hospital moved from West Hill Street, where it was built in 1952. The former McDuffie Regional Medical Center was close to shutting down because it had been hemorrhaging money before the McDuffie County Hospital Authority connected with Augusta's University Hospital and it saw the potential and need to keep a hospital in McDuffie County. University Hospital purchased the hospital and agreed to build a new $30 million facility near I-20 in Thomson. University Hospital McDuffie offers 24-hour services in the Laboratory and Radiology departments. The Emergency Department provides full-time immediate evaluation, stabilization and treatment care to more than 14,000 patients annually.